Laboratory Medical Oncology, VU University Medical Center, Amsterdam, The Netherlands. The science of one’s genetic background and its impact on disease susceptibility and drug response has come of age and firmly established its proper place in the clinic. Its impact is felt more in the treatment of cancer than any other disease area several reasons: critical time, narrow therapeutic index and overlapping toxicity window. We realize that the true potential of pharmacogenetics will be realized when we have been able to integrate other variants like insertion-deletion, copy number variation, etc., in addition to single nucleotide polymorphism for their collective influence on drug response and toxicity. Technology has rapidly evolved and has become affordable to be used in the clinic once it gets standardized and validated not only in one population but in several major world population -particularly those which are under-represented in human variant database. J Cancer Metastasis Treat 2018;4:52. The treatment scenario of colorectal cancer (CRC) has been evolving in recent years with the introduction of novel targeted agents and new therapeutic strategies for the metastatic disease. An extensive effort has been directed to the identification of predictive biomarkers to aid patients selection and guide therapeutic choices. Pharmacogenomics represents an irreplaceable tool to individualize patients treatment based on germline and tumor acquired somatic genetic variations able to predict drugs response and risk of toxicities. The growing knowledge of CRC molecular characteristics and complex genomic makeup has played a crucial role in identifying predictive pharmacogenomic biomarkers, while supporting the rationale for the development of new drugs and treatment combinations. Clinical validation of promising biomarkers, however, is often an issue. More recently, a deeper understanding of resistance mechanisms and tumor escape dynamics under treatment pressure and the availability of novel technologies are opening new perspectives in this field. 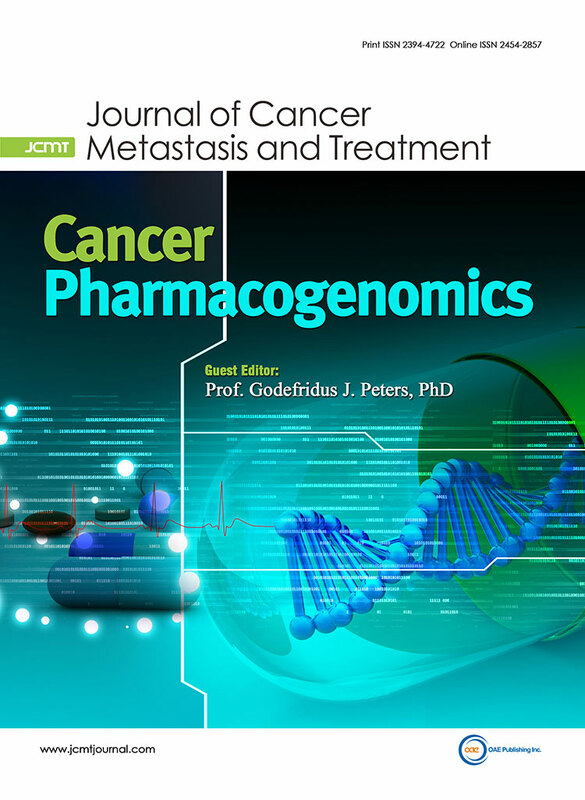 This review aims to present an overview of current pharmacogenomic biomarkers and future perspectives of pharmacogenomics in CRC, in an evolving scenario moving from a single drug-gene interactions approach to a more comprehensive genome-wide approach, comprising genomics and epigenetics. J Cancer Metastasis Treat 2018;4:12.